This module uses a 555 timer chip to delay sending a short trigger pulse once the relay has been activated. Upon activation (Momentary trigger via a push button switch for example) the relay will disconnect power for the primary output, wait a period of 0.5 – 2.5 seconds and then send a short 1-2 second trigger pulse to the secondary output before resuming power back to the primary output. 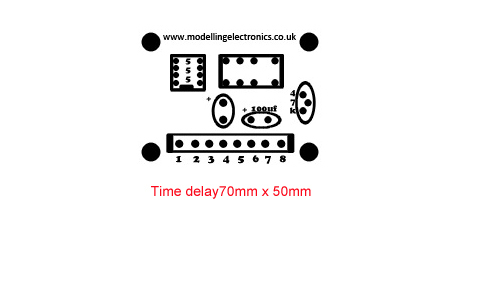 The time delay can be adjusted via the variable POT fitted to the right hand side of the module. The time of the trigger pulse depends on the time of the delay, the shorter the delay the longer the trigger pulse. The longer the delay the shorter the trigger pulse. To adjust the time delays insert a small screwdriver into the center of the variable POT and turn fully clockwise. This will set the module timer to the shortest delay. To extend the delay turn back (anti-clockwise) the variable POT in very small increments and re-test the delay. 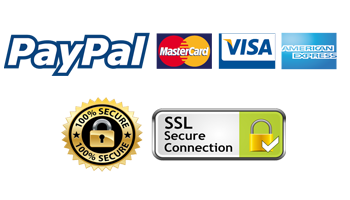 The variable POT can only be turned one third max anti-clockwise or the device will not function. If this happens turn the variable POT clockwise in small increments until the device starts to function again. 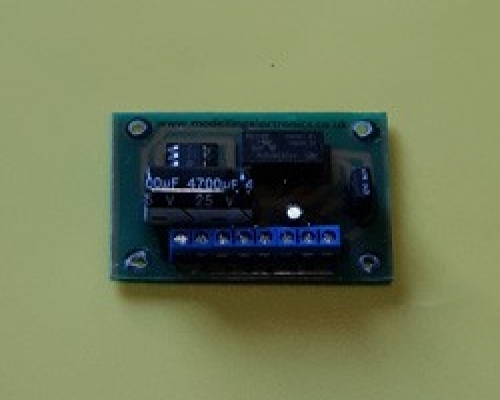 This module can function with a DC power supply of 9-15v only. The primary and secondary outputs provide a voltage equal to that of the supply voltage.